Motherhood is no easy calling. As if everything your days requires of you isn’t enough, feeling blue on top of everything else can make life seem quite insurmountable. 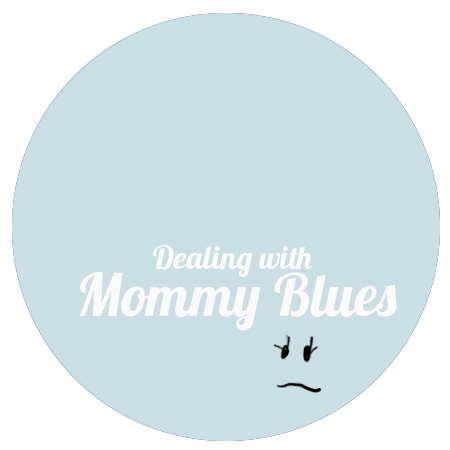 Here are somethings that I’ve personally learned about dealing with feeling blue. This is by no means medical or professional advice, if you need to take meds for depression or need counseling, of course, get the help you need. It seems like the key to staying out of the dumps is to striving to keep a well balanced physical, social, emotional, mental and spiritual life. It is impossible to keep it all perfectly balanced. The trick is to not go crazy in any aspect of our lives. As soon as you find that whatever ‘good thing’ you are doing in your life starts to hurt other areas of your life, you know it is time to cut back or eliminate. When you are feeling blue, it’s helpful to re-evaluate those different areas in our life to see what we could to do lift up our spirits. Here are some things that have helped me in those areas. Some might seem so obvious but I know I can easily overlook them at times. Physical: Taking care of yourself physically is vital is achieving a sense of wellbeing. It is SO important, don’t fool yourself into thinking staying up late, eating junk and sitting around all day won’t affect you, because it totally will! Make it a point to ‘get out’ and step outside your cave called a home, feel the elements-the sun, breeze..ahh such simple things can really lift a down trotted spirit. Plan in exercise Go for a walk or a run. Eat healthy. Get the sleep you need. Play outside with the kiddos. When your body says “I need a break!” Listen!! It is the best way to respect yourself and your limits. In fact it is one of the best ways to respect everyone else around you because you when take the time to take a rest and take care of you, you will be a better you and that is the BEST thing you can give anyone! Social: If you’re feeling down, chances are that you are not alone. Women need other women for support. Call up a friend, set up a play group..even if you don’t necessarily feel like it…that friend might need it as much as you do. Let the kids play and allow yourself to just talk. Many times talking about our experiences and listening to others helps you feel less crazy and more human because others are going through simliar things. Take time to love! We are social beings and need one another. Don’t feel loved? Take time to give love and the feeling your try to share with others will come right back to you. If love is given, love will be felt! Emotional: Having good social bonds can help with your emotional well being, but when you feel like you don’t really know who to turn to vent and sort out your feelings, often time the best place is a pencil and paper. Journaling can help you get in touch with yourself and get to the root of your emotions and thoughts. Mental: Exercising your mind is as important as exercising your body. Seek to continually learn through books, classes, and online tutorials, etc. I usually have a challenging project that I’m working on that continually motivates me, keeps me wanting to seek more information online or ask others questions. Stay curious! Spiritually: It is important to take time to get in touch with the higher power available to us. Make time to worship and ponder everyday. Pray for guidance. Meditation and time to center ourselves spiritually is key in acheiving a sense of well being. I want to share a personal experience that I feel is important in approaching this whole thing. There was I point not too long ago that I felt like I was doing EVERYTHING I could to stay a float and not feel down. I was exercising, eating well, trying to stay in contact with friends, reading my scriptures, doing service…everything in my power but I still feel so empty and down. Perhaps I was just trying to DO too much. I couldn’t figure it out. I felt frustrated that I felt blue when I really ‘shouldn’t feel that way’ or have ‘no reason to be sad’. I found myself fighting with my emotions and condemning myself for feeling that way. I felt like surely I must be doing something ‘wrong’ if I felt unhappy because ‘happiness’ is up to me and there is something I’m just not doing enough of to feel that happiness. It was a hard and gloomy time. But I learned something from that experience. I learned that sometimes we just go through down times in our lives for no apparent reason, and that’s ok. That in it of itself is part of the test and challenge of life. I ran into this booked called the ‘Depression Book’ that I picked up and had a chance to scan through. It mentioned that there is nothing wrong with feeling down. Assuming like there is something ‘wrong’ with you just because you are depressed is like believing there is something wrong in the world just because there is a night, or a winter. The book mentioned how feeling blue can actually be a good thing and to embrace it and learn from it. Agh. After reading that I didn’t want to read anymore, but the more I thought about it, the more I realized how it might just be so. When you are down, you have a chance to focus on yourself and re-evaluate life and what is going on. You pay attention to things that you otherwise wouldn’t. I know every time I’ve gone through a depressed time, and I’m able to get out if, I learn SO much about myself. The contrast of feelings, emotions, thoughts from being in both a down and then a happy state helps you understand yourself so much better. It also empowers you to sympathize with others and help those that might be experiencing those same emotions. Even though I feel so weak and helpless as a person when I’m going through a down time, I’m learning that it doesn’t mean I’m regressing as an individual. Often time I feel like I return as a stronger, wiser person because of it. I’m learning that is good to let yourself feel the way you feel. You’ve got to validate your own feelings without continally just trying to slam them, ignore or supress them. Let them exist. Understand that is ‘too shall pass’ but do what you can to start doing things to help yourself climb out of the dumps. Always remember to be patient and kind with yourself in the process! Respect yourself, you are so worth it! For another perspective read “How to prioritize your day to create the most joy for you and your family” post! What kinds of things do you find help you when you find you are in the dumps?. ← How to create a meal plan that works for you!